Producing this wine atlas was an enormous challenge for everyone involved. 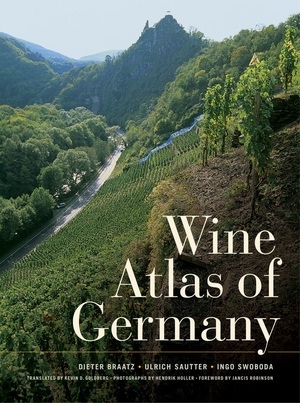 The atlas contains general and detailed maps of every German winegrowing region and classifies the 2,658 different German vineyards according to four quality categories: "exceptional," "superior," "good," and finally the broad majority, vineyards without any special distinction. Such a stark differentiation allowed for consideration of environmental conditions while also acknowledging the human factors in the winemaking process. Vineyards can be "superior," for example, as a result of the way they are cultivated by winegrowers or even as the result of various administrative or political advantages. Differences of this kind were accentuated by the German wine law of 1971. The intention to simplify parcel names triggered the consolidation of individual sites into larger, single-branded vineyards. The law thus enabled winegrowers to rebrand some second-class vineyards with the names of more prestigious and recognizable neighboring vineyards. At the same time, several vineyard names associated with prime parcels (however small) disappeared from use. What came about was not the successful reclassification of German vineyards but rather unprecedented disarray. Those seeking to evaluate the quality of a particular vineyard should be able to assume that all its parcels are of similar quality, no matter where each parcel might be situated in the vineyard. Since the passing of the 1971 German wine law, this is no longer the case. In many places, the authors were forced to decide whether a particularly strong or weak parcel of a vineyard played a decisive role in the overall quality ranking. To be as fair as possible, we decided that the prevailing reputation of a site would serve as the basis of the ranking. This means that several sites might be ranked low even though the vineyard's best wines are of "exceptional" quality, because wines from the less favorable portions of the vineyard are more widely distributed and have been more influential in the marketplace. In such cases, the circumstances are precisely described in the relevant site profile, so that each decision can be put into context. The authors strongly urge that the German wine law be amended to once again permit the use of parcel identifiers on labels in order to give more credibility to vineyard names. Our work on this atlas has underscored for us the merits of impartially classifying all pertinent top-quality vineyard parcels rather than recognizing only the current bloated, oversized vineyards. Only in this way can the character of each site be preserved, allowing us to approach German wine with a view that is cultural and sustainable rather than transient and economically shortsighted. Our four-class hierarchy is based on the model of Burgundy. There, the top tier of production is designated grand cru. Like the grands crus of Burgundy, the "exceptional" vineyards in this atlas offer outstanding wines with distinctive, consistent qualities. Among the required characteristics are great balance, the potential for cellaring, and an exemplary balance of aromatics and flavor. The second-ranked category is designated "superior" (equivalent to the premiers crus of Burgundy). Although wines from these sites, too, may be first-rate, they frequently accentuate a single attribute and may seem less complete. For those consumers who prefer particular taste profiles, these wines can offer satisfaction that matches or exceeds that of wines from "exceptional" sites. The third tier in Burgundy is designated by the term village. The particular site (if mentioned at all) is specified on the label of those wines. The corresponding term in this atlas is good. This generally refers to vineyards of above-average quality (sometimes even superior but not consistently so), which can show the local character of wines through particularly accentuated characteristics. Naturally, most vineyards belong to the final category of those without distinction. It should not be said, however, that the vintners who cultivate these parcels put forth little effort or that the wines produced offer no value. Rather, the natural conditions restrict the quality that can be achieved. The negative effects of the 1971 wine law have been rigorously debated since 1984 by the Confederation of Predicate Wine Estates (Verband der Prädikatsweingüter, or VDP), with the threefold goal of reinvigorating the renown of German vineyards, giving dry wines the recognition they deserve, and establishing an explicit, traditional taste profile for the concept of Prädikat (distinction). These discussions led to a classification model in which wines were graded according to a quality pyramid: table wine (Gutsweine or Ortsweine), classified wine(klassifizierte Lagenweine), and wine from VDP premier sites(VDP Erste Lage). A prerequisite for this classification was a precise demarcation of the best parcels, which VDP members were to carry out in their own vineyards. As a basis for the classifications, historical vineyard maps were consulted to determine which sites were historically regarded as superior according to certain criteria (high land taxes, for example), as well as a vineyard's record of producing high-quality wines over the course of decades. The designation Erste Lage was given to the highest class of wine and was marked by a logo showing the numeral one with a grape bunch on the label or directly on the bottle. This logo marks the qualifying vineyards on the maps in this atlas. All wines of this category are produced with a focus on terroir. Dry wines of this category are indicated by the term VDP Grosses Gewächs (great growth), except in the Rheingau, where the term Erstes Gewächs (first-class growth) is used. Wines with residual sugar carry the traditional designations of Spätlese through Trockenbeerenauslese. Besides Erste Lage, there are other classified vineyards whose wines are permitted to carry a designated name: these are the Zweite Lage (second-ranked sites). Vineyard names appear only on wines of these two classifications. All other wines are marketed without indication of the vineyard of origin. The VDP's classification scheme has done the great service of directing consumer attention back to the quality of vineyard parcels; however, it has also introduced many problems. A comparably easy defect to fix is the confederation's overgenerosity in acceding to the wishes of its members. A more serious problem is that the quality rankings of the VDP are incompatible with the classifications specified by current wine laws. For example, wines designated by the VDP as Grosses Gewächs are considered ordinary table wines (Qualitätswein) under the 1971 law. The latter is a legal concept that exists independent of the VDP's minimum requirements: for example, it does not prohibit certain types of enrichment. A further difficulty of the VDP scheme is its requirement that a site name be used exclusively for a single wine type. A vintner who produces a Grosses Gewächs wine in an Erste Lage vineyard cannot use the same vineyard name for any other dry wines, or even for a fruity, sweet Kabinett wine. Countless wine estates complain that this statute severely curtails their competitiveness in the market. Furthermore, the Grosses Gewächs and Erstes Gewächs distinctions can be limiting for winemakers. In many cellars Grosses Gewächs are simply the dry wines of the vintage that are highest in alcohol, made from grapes with the maximum ripeness possible for dry-styled wines. However, in classic Riesling growing areas, the most prestigious wines are not necessarily produced in a dry style. Even in southern Germany, a region that has traditionally leaned toward a drier style, Grosses Gewächs is a new and relatively untested concept. Whether this trend remains viable, in which the Grosses Gewächs wines reflect their terroir of origin and exhibit minerality and a long life, remains to be seen. Finally, the VDP's classifications apply only to its member growers. Until all German vineyards are included, the VDP system remains only a good beginning. For that reason, the authors of this atlas have striven to include sites of non-VDP members as well. And although the classification used here obviously does not lay claim to a complete engagement with all important discussions, the authors wish to assert that their work is unbiased and independent of vested interests. The most important classification models, namely those currently used in Burgundy and in the Médoc region of Bordeaux, were developed from the assessments of merchants, collectors, and other experts. The authors have followed this practice by collecting data from and speaking with many participants in the wine industry. Vintners are naturally biased in favor of their own vineyards. Nonetheless, the information provided by growers forms the most important data source for this atlas. Their perspectives are considered in conjunction with the judgments of wine merchants and the appraisals of the market. An essential criterion in the classification scheme was the authors' own tasting of wines from the corresponding vineyards. Final decisions were often made by visiting the vineyards, where all individual components blend into a harmonious whole. Featuring sixty-seven exceptional color maps as well as eighty-seven vivid images by photographer Hendrik Holler and others, this is the most comprehensive and up-to-date atlas of German wine—a detailed reference to vineyards and appellations. The authors explain the geography of all the German wine-growing regions and provide independent analysis and ranking of the most significant vineyards in each region. In addressing the growing American appreciation of German wines, the atlas pays in-depth attention to Rieslings from the Mosel and other premier regions while also acquainting readers with wines from less familiar areas such as the Ahr, Baden, the Taubertal, and Franconia. Beautifully produced, with helpful sidebars and succinct essays, this book will become the standard reference on the subject. Dieter Braatz is Deputy Editor-in-Chief of the German magazine Der Feinschmecker and author of a guide to Germany’s best wine estates. Ulrich Sautter is the author of Wein A-Z. Ingo Swoboda writes for Der Feinschmecker and is the coauthor of Riesling. Kevin D. Goldberg (translator) is an Instructor of History at Kennesaw State University and the author of a forthcoming book on the history of the German wine trade. "For the diligent student or even the mildly curious, it's a great way to learn about the complexities of German viticulture and law as well as the names of all the great vineyards. The book also lists producers the authors deem good, superior or exceptional—so even German-wine neophytes can locate those names on bottle labels." What Makes a Vineyard Unique?